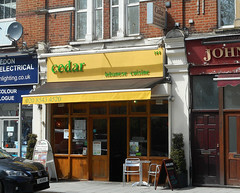 Lebanese restaurant in South Wimbledon. It's fairly small inside, seating about 30 people at two lines of tables on either side of a central aisle. bob, Martin, and Northern Steve have visited a few times, now, most recently in January 2019. On a Thursday evening in May 2009 it was quite busy when we turned up around 9pm, but still just had room to fit us in, and quietened down over the hour and a half we were there. There was no music. Service was friendly. We decided to share nine starters and two main-course mixed grills between us, which turned out to be the right amount of food. Among the cold starters, tabbouleh was fresh and pretty good, and consisted predominantly of herbs (as it should do). Makdous (stuffed pickled baby aubergine, served cold) was pretty good, with the aubergine cooked nice and soft. Bastorma (diced, cured beef) was made from pretty good beef, and tasted a bit like bresaola (Italian cured beef). Moving on to the hot starters, hommos kawarma (hummous with spiced lamb) had smooth hummous with only a subtle tahini flavour; bob thought the hummous was pretty good, while the lamb was fine but nothing special. Foul moudammas (fava beans with chickpeas) was fine — bob, who doesn't actually like either beans or chickpeas, even had seconds. Kallaj (toasted halloumi-topped Lebanese bread) was quite salty to bob's palate, but then halloumi does tend to be salty, and Martin was quite pleased with it. Makanek (sausages in pomegranate sauce) weren't bad; the sausages themselves were OK, despite not really being as spicy as advertised, and the pomegranate flavour added a nice tang. Soujouk (spicy Armenian beef sausages) weren't particularly spicy either, though Martin thought they were a real highlight. Jawaneh (chicken wings) were a decent size and obviously charcoal grilled, and the garlic sauce they came with was good too. Although the mixed grills are in the "main course" section of the menu, we asked to have them served at the same time as the starters. They're served with a choice of chips or rice, so we went for both. The chips were pretty good. The rice was (we think) baked, and also good, if possibly a touch sweet. The shish kebab component of the mixed grill was pretty good, and the lamb and chicken cubes were fine. We also got given two portions of bread which they didn't charge us for and probably came with the mixed grill - don't think they'd have minded bringing us more, though. We finished up with some baklava, which was served at room temperature and was all pretty good. We drank Lebanese beer (£2.85/bottle), which was fine. There was a wine list, but we didn't really look at it. With the 10% auto-added service charge, our total bill came to £102.41 for the four of us. Accessibility: One shallow step to get in. There's a small step (which is ramped) to get to the toilets, and there's a toilet with a wider door than normal, and the wall-mounted rails you'd expect to see in a disabled toilet. In general, the place could probably cope with a wheelchair, but we'd not like to guarantee it. Last visited by bob, Martin, Northern Steve, January 2019. Opening hours taken from Facebook page, January 2019. Last edited 2019-01-13 13:45:31 (version 9; diff). List all versions. Page last edited 2019-01-13 13:45:31 (version 9).